Hang around PhoneArena or any other publication focused on the mobile industry long enough, and you're bound to stumble upon the word 'fragmentation'. But what does fragmentation mean in the context of Android? Simply put, it refers to the inability of any one player, including Google, to put the entire market onto the same version of its mobile OS. This is problematic – older versions of Android are no longer officially supported and receive no updates, including security ones, leaving users stuck with devices that are left to die a slow death. According to Google's latest stats, relevant as of March 2nd 2015, only 3.3% of the total Android population is running on the latest Android 5.0 Lollipop update. 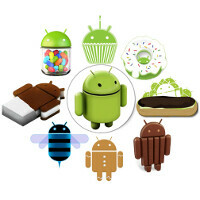 Of the remainder, 40.9% make use of Android 4.4 KitKat, 42.6% have one of the various Android 4.1-4.3 Jelly Bean builds on board, and 5.9% rely on Android 4.0 Ice Cream Sandwich. The last 7.3% are split between Android 2.3 Gingerbread (6.9%) and Froyo (0.4%). But when we asked you on Monday to vote for the Android version your own device is running on, we expected to see quite a different split, and we weren't disappointed. In fact, we were even a little surprised to see as many people (38.5%) indicate having the latest Lollipop build running on their daily drivers. The most popular version remains KitKat, though, with 45.42%, while 10.98% have Jelly Bean, and 1.74% run Ice Cream Sandwich. So why are the results so vastly different from Google's sample of the entire market? There are several reasons that explain such disparity. First off, if you're on PhoneArena and are engaged enough to participate in votes such as these, it is more than likely that you also know more than the average Android user out there. While we obviously don't have the data to back this up, the previous means that your engagement with the mobile industry makes it more likely for you to have a newer, up-to-date device in your pocket. Further still, the power user crowd, while only a fraction of the Android total, is disproportionately more vocal and far more inclined to participate in relevant polls, so they're over-represented. Those are also the people that can and do make use of third-party custom ROMs for their devices, which usually means much earlier access to the latest thing compared to having to wait for an official update, like the typical Android user does. I stated 4.4 version which is on primary phone. But I have also 5.0.2 on my tablet and 4.1 on my spare phone. Anyhow this is not interfering with poll results. 84% for PhoneArena members, not the whole world. Currently using Android 2.3 on a Pakistani phone Qmobile Noir A1 2012. What did I say. I am using Android 2.3 on a pathetic phone. That's a lot of Frag...Google needs to clean this mess up. Why can't Google be like Apple. when it comes to updating it's phones. Which is easier to handle, a class of 5 students or 15 classes of about 20 students each? Same thing with Apple and Google. Google has to handle updates for loads of manufacturers, while Apple only has to handle updates for 1 manufacturer, themselves. Well my take is go to private school then. Your logic doesn't add up. My G3 is stuck on 4.4.2 and my Turbo is stuck in lala land somewhere. How is your G3 still stuck on 4.4.2? The G3 was one of the first to receive the update out of all of the flagships. And this is hardly any frag. When you look at what is running what, all LEDC's are running the low ends, cuz those phones are ridiculously cheap, while the MEDC's are smashing out KitKat or Lollipop on their devices. You can't compare Google and Apple together; two complete different structures and game plans. I know right, and even with those ancient specs, the iPhone still trumps Android in gaming. Yes and then you realize phones have no games. Verizon still hasn't released the lollipop update for the LG G2, do they even have it yet? I was excited about Lollipop, but reading more and more about it, it seems like right now it's a bit buggy. I think I'll stick with Kit Kat for now, I'm getting Lollipop features updated via Play store anyway. I an waiting for a true 64 bit Android with Vulkan api support. I am going to buy a mid range Windows 10 handset this year if Ms decides to support sideloading. Go to my facebook timeline, there is error coming here on this site. I can't paste the links here. Type Saad Naeem (Trevor). Poll fail... where is 5.1? Poll was done before 5.1 was officially released. Plus it is only on Nexus and the Moto X so no point to have it with so few devices supported. This means that MOST Phone arena user were on high replacement cycle (less than 2 years).